During World War II, “El Capitan” served with distinction providing vital cargo runs for the US Military. On her final cargo mission, between Tuglai and Guadalcanal, its said she was struck by a torpedo from a Japanese submarine. The said impact destroyed the ships engine room and boilers, but did not sink her. The damaged ship was towed to Florida Islands (Solomons) for repair, and spent the remainder of the war serving as “floating quarters” and material storage ship. Following the end of the war the ship was towed to The Philippines and eventually her name was struck from the Navy’s list (28th of March 1946). Whilst waiting at anchor in Subic, to be returned to her pre-war owner, E.K. Wood Lumber Co., of San Francisco, California, she was sunk in a storm. “El Capitan”, also known as “USS Majaba” received one Battle Star for her service during World War II. This ship is a fairly conventional steam-powered freighter and her plate rudder design signifies that she was an older design of ship than most freighters used in the Pacific during World War II. 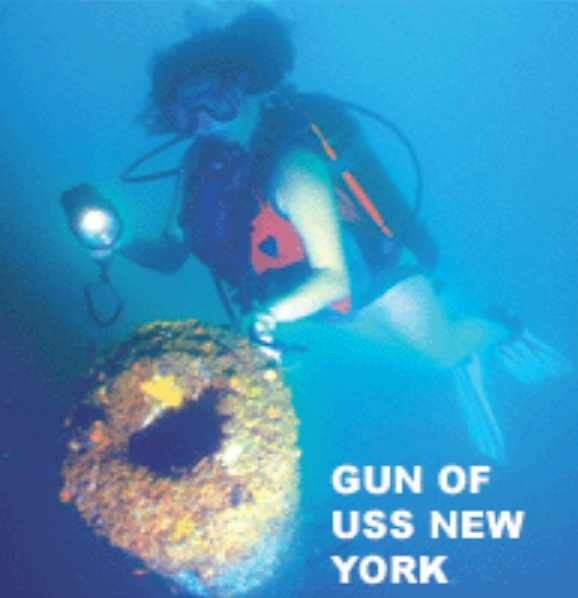 The existence of a large gun platform at her bow indicates her participation during the conflict, although the lack of any obvious explosive damage seems to indicate that she did not sink in action. Located on the edge of a shallow sloping reef, the most likely cause of her sinking seems to be collision. The wreck lies on its port side in a maximum depth of 22 meters, with the starboard side only 4 meters below the surface. She is approximately 3,000 t., 80 meters long and structurally intact. Divers can enjoy swimming inside her massive forward and rear holds and if properly trained and equipped, enjoy comparatively safe penetration into her cavernous boiler room. 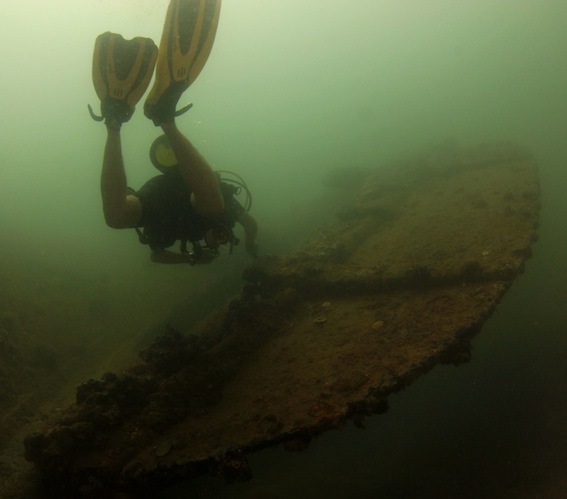 The combination of good visibility, shallow depth, no current and intact structure makes this wreck an ideal starting point for the novice wreck diver. This wreck is well known amongst divers due to a fairly large air-pocket (click to view YouTube clip) in one of her cargo holds. When surfacing the pocket of air located at a depth of around 10 meters its very important to keep breathing thru the regulator due to the potentially toxic air. 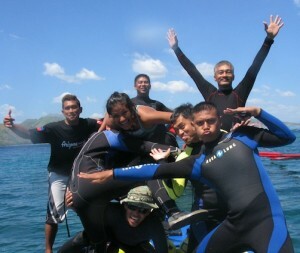 All in all, “El Capitan” is a fun wreck to dive on, suitable for both beginners and more advance divers. Click on the link to view a video clip from the El Capitan wreck site.